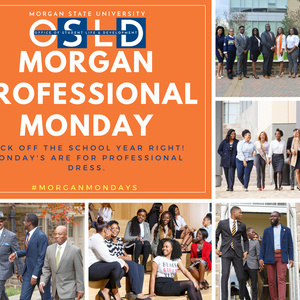 Calling all Students, Staff, and Faculty to join in the Morgan tradition of Professional Dress Mondays'. Every Monday throughout the academic school year the entire Morgan community engages in this tradition. Share your videos and photos via social media using #MorganMondays. For more information, please contact the Office of Student Life & Development.